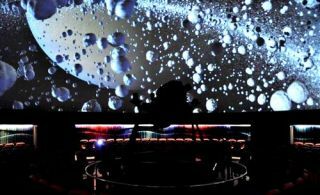 Christie Boxer and Evans & Sutherland’s Digistar 5 system installed a immersive cosmological experience in Bangkok Planetarium. Deep space journeys and close-ups of objects in the farthest depths of outer space are attracting new visitors and enticing familiar patrons to return. Part of a major renovation through E&S’ local agent, Siam TC Technology Company, that included the installation of 280 new, customized leather seats and a themed wall and lighting system, the installation is popular with astronomy buffs of all ages and features two Christie Boxer 4K30s projecting seamlessly onto the 65-foot (20 meter) dome using both the Digistar 5 and existing Zeiss system. Scott Niskach, Director of International Sales for Evans & Sutherland, said the Zeiss optical mechanical projector – while effective – is limited to Earth-based observation such as observing the constellations, while the Digistar 5 system can lift off from Earth, penetrating deep into the cosmos, affording the opportunity of seeing the planets, nebulae, distant galaxies, and other intergalactic matter up close in seconds. “You can rotate around and see the individual stars at different times of year with the optical projector but you can’t ‘lift-off’ from the Earth with it, so we integrated the Digistar 5 into the existing system. Digistar contains the entire known universe modeled in three-dimensions allowing audiences to fly through the stars and experience front-row views of the most amazing places astronomers have discovered,” said Niskach. Using two Christie Boxer 4K30s, Evans & Sutherland did a center (front and back) installation using customized fisheye lenses to shoot around the optical projector, thereby avoiding shadows on the dome. E&S also integrated their auto alignment and auto blending systems to calibrate and maintain the seamless beauty of the fulldome image. This is the first installation of two Boxers in the center of the theater. Michael Daut, Creative Director/Marketing Director for E&S, emphasized how key the omnidirectional capabilities and brightness of Christie Boxer projectors were to this project. “The Christie Boxers were able to fit into the position where we needed them because of their omnidirectional capability," said Daut. "It’s a very steep angle – probably an 80-degree angle – almost vertical, where the Boxers are. It was a great fit for the Boxer and I doubt we could have done it with another projector." Daut noted that there also needed to be enough flexibility to not only cover the immense dome, but also to balance the brightness between the optical stars and the digital system when they are used together, for example when the digital system provides stick figure outlines to connect optical stars together into constellation patterns.